Gaffer Paul Hughes made a solitary change to the previous Saturday’s United starting XI at Barking as Priestley Farquharson was preferred to Tom Jelley in the United defence while skipper Scott Donnelly was fit enough to return to the bench as he continues his recovery from injury. 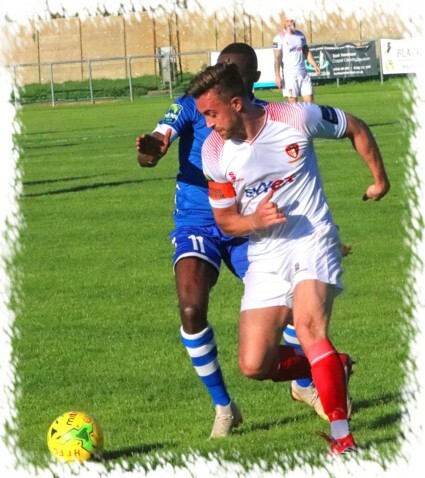 Hayes & Yeading got off to a real flyer on a beautifully sunny October afternoon at Hertingfordbury Park as left wing-back Toby Little fired United into a fourth minute lead before adding another on 15 minutes as United continued to push upwards in the Bostik South Central table. As already mentioned, United opened the scoring in just the fourth minute when a forward surge by Little saw him being body checked to the ground by Matt Thomson two yards outside the home box. 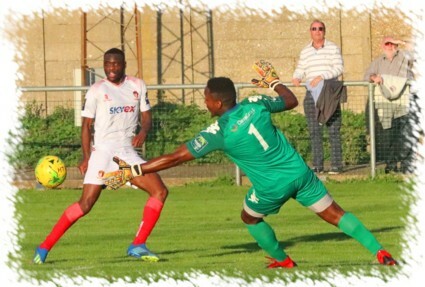 Little dusted himself off and curled a prefect free-kick around the wall and into the corner of the Hertford net as ‘keeper Lamar Johnson stood rooted to the spot in the middle of his goal. The next real chance of the game saw United and Little bag a second on 15 minutes. Lee Barney did well to win possession after Hertford’s Charlie Ruff had controlled a long Jack Smith clearance midway inside his own half of the field. Barney quickly switched the ball to Hassan Jalloh who in turn fed the overlapping Roddy Collins who pulled the ball back to Little who smashed it home from just inside the box with the aid of a small deflection. Minutes later United nearly had another. Little and Scott Bridges combined with the latter firing the ball upfield to Jalloh who turned his marker and aimed his shot for the top corner of the Blues goal only for Johnson to tip the effort over the top. 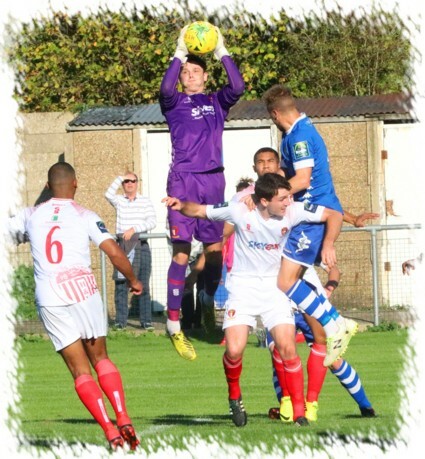 The resultant corner kick was part cleared to Bridges but his volleyed effort was held by Johnson. Just past the midway mark in the first half the home side were inches away from reducing the arrears with a free- kick of their own from just outside the United box as Ruff’s effort beat the wall and Smith before cannoning back into play off the upright before the danger was finally cleared after a brace of corners. Within a minute Hertford created another good opening, this time a deep ball across from the left found Thomson unmarked beyond the far post and he smashed the ball back across the six yard box but with no teammate closing in the ball went harmlessly wide of the far post. The final chance of the first period fell to United as once more Little outran Thomson on the left wing, his cross picked out Jalloh on the edge of the box but his drive was just too high to trouble Thomson and United went in with a two goal lead at the break. Chances were to be plentiful in the second half but only one further goal was added to the tally. A half-time substitute for United, Tom Jelley, was quickly into the action as his cross-field pass found Jalloh who saw his first time effort go just the wrong side of the upright. Four minutes later Jelley was again in the midst of the action as a deep ball was collected on the left side of the United box by Dave Keenleyside who tried to loft the ball over Jelley only for the ball to strike his raised arm from a yard away, this being deemed a deliberate act by referee Reeson who pointed to the spot. Keenleyside took the kick himself only to be thwarted by a fine diving stop from Smith with Ed Asafu-Adjaye sliding in to complete the clearance as United maintained their two goal advantage. Two chances came and went for United before the hour mark. Barney won the ball and found Jalloh who turned his marker only to be denied by Johnson who did well to block the ball wide of the goal. This was quickly followed by Bridges clipping a free-kick to the far post where skipper Liam McDevitt knocked the ball down to Lewis Toomey who scooped his effort over the crossbar. Past the hour mark the home side had another half chance as George Lutayaa worked space on the edge of the box only to fire too high from 18 yards and then with 20 minutes left United as good as killed the game. Jelley picked off a poor Johnson kick out and played the ball immediately to Bridges who exchanged passes with substitute Scott Donnelly before sliding the ball to Barney who turned the defence inside out before firing home his 13th of the campaign. With the game effectively won, chances continued to come and go for United. Little found his way around the back of the home defence before pulling the ball back to Barney, his shot being blocked wide by a perfectly timed Ben Crilley interception with the goal beckoning. With ten minutes remaining Donnelly and Barney combined to create an opening for Jalloh who fired across the goal and wide, this being quickly followed at the other end by Ruben Soares-Junior setting the ball nicely for Blues striker Elliott Bailey who fired weakly at Smith from the edge of the box. 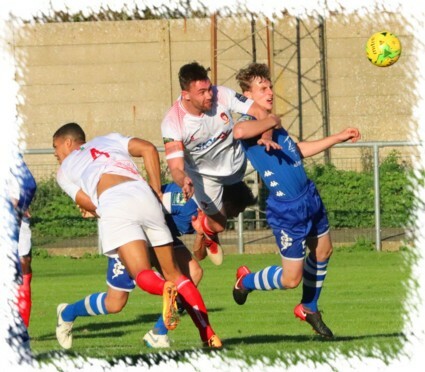 The final few minutes saw two good chances fall to 18 year-old United substitute Great Evans who had netted his first United goals on Tuesday evening at Edgware Town. The first saw Donnelly find Little, his deep cross being met on the volley by the United striker but straight at Johnson who grabbed it at the second attempt. Then in stoppage time Barney collected on the right inside the Blues area, his cross finding Evans inside the six yard box, the striker somehow managing to find the post with just Johnson in his way.